Kajol's selfie with two of the most powerful Bengali women in the country -- actor-politician Jaya Bachchan and West Bengal Chief Minister Mamata Banerjee, is one adorable picture you cannot miss. Kajol’s selfie with two of the most powerful Bengali women in the country — actor-politician Jaya Bachchan and West Bengal Chief Minister Mamata Banerjee, is one adorable picture you cannot miss. 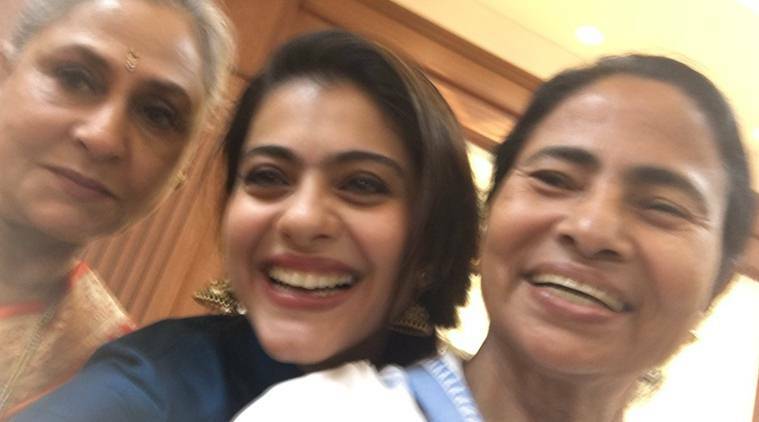 Kajol’s selfie with two of the most powerful Bengali women in the country — actor-politician Jaya Bachchan and West Bengal Chief Minister Mamata Banerjee, is one adorable picture you cannot miss. All the three ladies seemed delighted in each other’s company while getting clicked in a single frame. Kajol shared this picture on her Twitter account and captioned it,” A lil blurred but such a clear women’s club. Had to put it out.” Kajol, Jaya Bachchan and CM Mamata Banerjee have one thing in common – their Bengal connection. While it’s common to spot Kajol and Jaya Bachchan at Durga Pooja events in Mumbai every year, seeing them catching up with Mamata Banerjee is one rare instance. The three were seen chatting and enjoying themselves at the 22nd edition of the Kolkata International Film Festival. A string of other Bollywood actors also made it to the week-long KIFF on Friday. Amitabh Bachchan, Shah Rukh Khan, Sanjay Dutt and Parineeti Chopra were present at the event. Old friends Kajol and Shah Rukh Khan were also seen interacting as they couldn’t stop laughing at times. We wonder what they were talking about. Shah Rukh Khan, who is the brand ambassador of West Bengal tourism tried his luck by speaking in Bengali and ended up sounding adorably cute. “Bangla bolbo na eki kokhono hoye? (How can I not speak Bengali),” Shah Rukh Khan said while addressing a crowd in Kolkata. In the presence of Banerjee, the star continued his Bengali speech while the crowd smiled at his cute attempt to grasp the proper Bengali accent. The actor confessed that his Bengali is weak and told Jaya Bachchan she can chastise him later. As many as 15 films from 13 countries have been selected for the international competition (Best Film by a Woman Director and Best Woman Director).